The caravan and camping park is surrounded by the hills of Beinn a Chairein, Carn Dubh-Ghlaic and Carn Bingally, and is further sheltered by the Scots pines and birch trees growing throughout the park. Half of the touring area has serviced pitches for touring caravans and motorhomes, and the other half is ideal for small to medium sized tents. 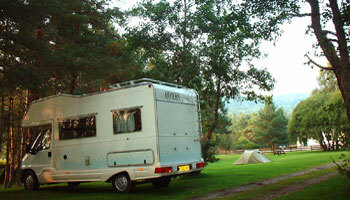 We are happy to take bookings for touring caravans and motorhomes requiring electricity. If you do not require electric hook-up, please do not book in advance as we do not operate a reservation system. 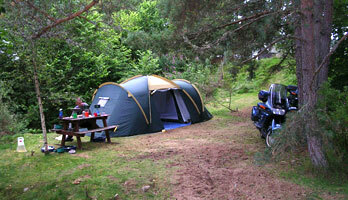 We do not take bookings for tents requiring electric hook up.